If there is a day where your ethnicity truly stands out, it has to be report card day. If you have been raised by South Asian parents, you know what I am talking about. Your parents could have been the sweetest, politest head nodding in agreement sort until the day your school smarts is up for evaluation. If it didn't read praise all the way through you probably were in trouble. My three-year-old completed her first year at pre-school this past week. Even though it was only thrice a week, we have seen her progress leaps and bounds from a little baby back in the fall to a "big girl" as she likes to refer to herself now. 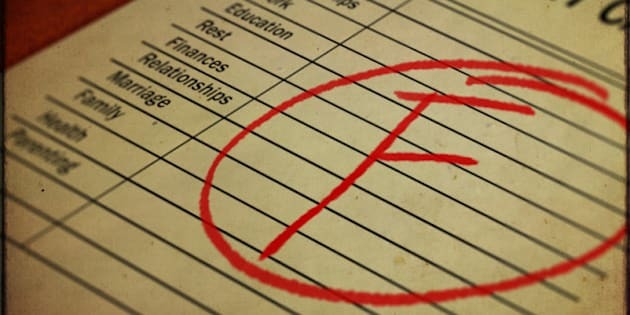 Throughout this time there were only two incidences where I worried about her development; the mid-year and end-year progress reports, otherwise known as report card day. If there is a day where your ethnicity truly stands out, it has to be report card day. If you have been raised by South Asian parents, you know what I am talking about. Your parents could have been the sweetest, politest head nodding in agreement sort until the day your school smarts is up for evaluation. If it didn't read praise all the way through you probably were in trouble. If it largely was a positive report they would still find that one remark hinting at an area of improvement and oh boy you would never hear the end of it. "What is this minus with the A? Not good enough for the A alone I see. Tsk tsk . No TV for the summer." "How are you going to become a doctor with this kind of result?" "But mom I'm only six!" "Doesn't matter, look at Doogie Howser." Perhaps it is a residual effect from our post-colonial "Gora Complex" where the "White Man" represents excellence in standard and status and even after so many years we are trying to regain our power by constantly feeling the need to do better and be better or at least equal them. The best way to achieve this is of course, education. "No one can take your education from you. " Isn't that what was drilled in our heads the moment we learned how to talk. Perhaps it is simply built into our genetic makeup much like the Asians. We desis are obsessed with evaluation. Not just with how well we do in school or in our jobs but how we are doing compared to others. There is an innate competitiveness that can at times get out of control. I am all for getting good grades and striving for the best in school and beyond because let's face it, it is a competitive world and even though grades don't mean everything they sure can make getting in those initial doors a lot easier. But how much pressure is too much? Are we pulling our kids into this rat race too young? When I saw my daughter's mid-year report and mind you she was only two and a half then, the first thing I noticed was an observation that said her scissor cutting motor skill was 'developing' and not at the 'expected' level. Everything else was where she should be and the comments from the teachers were glowing about her sense of humour, her innate rhythmic sensibilities and verbal skills. Report card; school; classroom. But being desi I just assumed ALL the boxes would be checked at the expected level. For a moment I turned into my father and could feel the urge to 'discuss it' rise, wanting to hold a parent teacher meeting to see how she could improve on it. My husband gave me a look -- the reality check I needed. She was only two. I dropped the matter but couldn't help but make sure child friendly scissors were always around should she happen to want to 'practise'. When I saw my daughter's end-year report I prepared myself by taking away any kind of expectations. I still felt nervous as I opened the envelope. It brought back all the anxieties of examinations and evaluations from my childhood. I used to wonder why parents got equally stressed out as the child. I get it now. It was the exact same feeling I was experiencing now. Phew! All the boxes were checked where they should be. The comments were incredible and I felt so proud of my "big girl". But this got me thinking. Even though she is currently unaware of the concept of progress reports, I am sure at some level she picked up on my stress. Was that fair on her, especially at such a young age? With each parenting milestone I am learning so much about myself and the kind of parent I want to be. I realized I had a lot of the 'Tiger' parent in me and my husband a lot more of the 'Dolphin' parent. Healthy School LunchIt puts things in perspective and helps me pull away from the rat race. The adult world for our children will be very different from the one we are in now, we are at the start of the technological boom, who knows how life will be by the time they are grown up. The skills and talents they are born with now need to be nurtured for that time. We can only help them understand their strengths and weaknesses; guide them in the right direction if they feel lost. There is no strict formula for success any more. So while report cards may help identify areas of growth in our children, it should not be what defines them. Desi or otherwise, these are children of the world and we need to be there for them, teach them to soar. I've learned the following about the kind of parent I want to be. -Your child has a unique talent. Help them discover it and encourage it. -Your child is an individual. Don't compare with other children. Help them embrace it. -Don't be afraid of discipline. Your child needs to learn boundaries- but do not use it irrationally or to instill fear in your child. -There is no such thing as too much affection. -Treat report cards like a suggestion, NOT a definition. Hope it helps you on your journey with your child! This post was originally posted on masalamommas.com and was republished with permission.